Discover your options with a FREE MRI Consultation today! Most minimally invasive procedures are not that minimally invasive. Endoscopic surgery to treat spine problems is revolutionary in changing the way a spine problem can be treated with faster recovery, less pain, and likely better outcomes. Dr. Hanson has been amazing! He and Jackie have been super responsive and helpful. I was in an excruciating level of pain from a C5-C6 disc extrusion. With some right arm weakness and numbness through my right thumb, I was fairly desperate to gather a number of opinions and make some quick decisions about the best course of care and receive some pain relief. He went out of his way to help me upload my MRI images and reviewed them in detail with me. He clearly explained my options and what he recommended as a course of action. The referrals were made and I was able to schedule my non-surgical treatment. I really appreciate his experience and opinions, and really felt that his recommendations were in my best interest, regardless of the business it generated for him. I can't recommend him highly enough and if I end up needing surgery I will continue to work with Dr. Hanson. Thank you! Being 65 years of age and completing most of my bucket list...and having excruciating back pain ever since my fusion surgery at the Twin Cities Spine Center 6 years ago...and needing a new knee, the pain at times was too much to bear. There were times when I thought it might just be easier to check out as most of the things that I enjoyed in life were gone. The back pain made it difficult to work and I was burned out at asking my doctor for pain meds so that I could get out of bed in the morning. I was shuffled from doctor to doctor, having one doctor do irreversable damage to my back during a nerve block alblasion. No one cared enough to help. I got Dr. Daniel Hanson's name from another doctor, saw his partner Dr. Davies for injections on screws that were sticking into my back muscles and soon after, Dr. Dan had the screws out! I can tie my shoes, bend down and get dressed normally for the first time in 6 years. Dr. Dan Hanson really did save my life! I look forward to going back to enjoying life again this summer. Thanks to all involved. You are all wonderful. I would recommend them to anyone who is dealing with neck/back pain. The staff is excellent and Dr. Hanson is amazing at what he does. He listened to me and found the problem to my pain. I am only 27 and had dealt with neck pain for almost 6 years. Noone could figure out what was causing my pain and within the first visit Dr. Hanson discovered the cause of what exactly was causing my excruciating pain. I could of cried!! The relief of knowing I could be fixed and live an normal life again. I could do those little things with my daughters without being in severe pain. The activies that I skipped because I knew that I would be miserable the whole time. The surgery was only a couple hours and I was able to go home that very day. Now, that pain is gone and I am very pleased with the outcome. Again he is an amazing doctor and very good at what he does!! If you have back/neck pain I would give them a call. Trust me you will not regret it and you will be very pleased with your results!! Dr Hansen is amazing. I would recommend Minnesota spine to anyone, I know he will get me fixed. I hope. Everyone cares so much about my care and how I feel. They want the best and to be pain free for all their patients. I am truly happy for Dr Dan Hanson you save my back from everyday pain ! I had gone to do many surgeons no one wanted to help me they wanted to put brackets in my back that had to maybe be replaced ever 2 to 5 years then be laid up for 6 months plus you are truly my angel you saved me from a lot of pain and suffering I can move around pretty good after 14 days what a simple fix ! Thank you and god bless you for all your help I recommend you to every with my condition!!! Outstanding! Dr. Dan Hanson came highly recommended! I developed severe pain going through my left shoulder and down my left arm and ending in my fingers. I was urged to contact Dr. Dan Hanson of the Minnesota Spine Institute after the usual injections failed to give relief. I had the disc between C6 and C7 replaced as an outpatient procedure and felt great immediately. That was three days ago and I feel fantastic. Everyone that I came in contact with during the planning and execution of my procedure was great! Dr. Dan Hanson is a very talented surgeon and knows his stuff. If you have back issues, contact Dr. Hanson at the Minnesota Spine Institute. Best address in Minnesota for true minimal invasive spine surgery!!
" AMAZING!! I just had surgery the day before yesterday 7/9/18, & this surgeon Dr. Hanson & his team should be voted once again best surgeon in the U.S. When I thought I was at a dead end with this very bad spine of mine, no doctor cared in the least about how my back felt, the pain that I was taking in for 8 years of my life living on pain meds 6x a day. No Doctor here in Des Moines would even take me in for a appt. until I took off 25 to 30 lbs. Until 1 day I asked my hubbies hip Dr. to refer me to someone very quickly or I will end up in a wheelchair, Within1 week he referred me to Dr. Hanson at Minnesota Spine Institute, & thats where the beginning of my new journey to fix me started. I drove 4 hrs. to Minnesota & walked into his office in defensive mode scared to death that he would tell me I had to loose weight before he would see me like all the rest of the Dr.s, & immediately he picked my face up & told me to look at his face, his 1st response to my fear of rejection self was: "I want you to look at me, " This is not about what this doctor told you or that Dr. told you or your husband or family member told you, this is going to be about me & you only. I will treat you & I will fix you. And with that he did just that. We did some more testing & had my surgery 2 days ago & was up 1 hr. after walking down the hallways through my hotel & 2 days later have no pain only where incision was. He removed nerves from 3 Lumbars. This man is truly my miracle that I needed that will now change my life forever. Thank you Dr. Hanson & your team Jackie Frid & Melina. I hope you are proud as I am of you!! In 2010, at 39 years old, I had two ruptured discs. The pain was indescribable. My local surgeon (Western WI area) had given me only 2 options; repair the discs or fuse those 2 levels. He gave me no other real guidance other than one was easier to recover from and neither were guaranteed success. I sat and cried by myself, ultimately choosing the 2-level spinal fusion in hopes that this would eliminate all of the horrible pain and I would finally be able to move forward. While I recovered nicely and fairly quickly, a few years later I found myself with more and more pain, and despite my best efforts, it just continued to get worse... as in, I had very little quality of life anymore due to pain. By 2017 my friends and family were gently pushing me to seek help outside of our local area. I found Dr. Hanson through a friend of mine whose husband had used MSI to have 2 cervical discs replaced, and he was doing quite well. After I made contact with the Minnesota Spinal Institute, Dr. Hanson called me directly to talk about my symptoms and what was going on. Never would I have expected the surgeon to call me directly, and by the end of that conversation I KNEW that I had FINALLY found someone who would help figure out where this pain was coming from. To directly quote him, "we just need to figure out where your pain generators are and fix them." I cried with relief when I got off that call! I had hope for the first time in YEARS. It was determined that my #1 pain generator was likely the hardware in my back (6 screws, 2 rods) and Dr. Hanson suggested removing all of it. I believe my body had been fighting that titanium for years, and I am now 10 weeks post-surgery and getting better slowly but surely. Dr. Hanson has been very accessible both before and after surgery, and the word GRATEFUL does not begin to cover how I feel about MSI. I also need to mention that when my insurance provided denied my request for out-of-network service for MSI (and I was devastated), Dr. Hanson and his assistant, Jackie, worked above and beyond to secure me the very best self-pay rates for my surgery. Just like that, I was moving forward and had surgery 2 weeks later. I've learned a lot of lessons through all of this: there ARE doctors and health care providers out there who listen; be your own advocate; ask for help; think outside the box of from the big medical institutions. And to Jackie... you probably have no idea who much of a life line you were for me in those weeks, but I thank you (and Dr. Hanson) from the bottom of my heart. I had a micro-discectomy of L4-5 and haven’t felt this good in 2.5 years! I would give this place 1000 stars if it was a option!! Dr Hanson and Staff are truly Head and shoulders above the rest!! A+! Thank you again Jason!! My son has been a patient of Dr. Hanson since 2016. Dr. Hanson is amazing. After having his back surgery he has finally been able to get some pain relief. Jackie is also wonderful to work with. I would recommend him to anyone struggle with back issues. Dr. Dan is very personable and good with his patients. He listens and is able to give quality solutions. I suffered for over 4 months with lower back pain, it hurt to sit down, pain in my left leg. I seen a Chiropractor for months with no relief. I was being told by my GP and my Oncologist that my back pain was just "arthritis" or a side effect from my chemo,...Well guess what it wasn't!! I reached out to Dr. Hanson @ MN Spine and thank god I did. Dr. Hanson is so Professional, Caring, Dr. Hanson and his team gave me awesome patient care. Dr. Hanson showed me my MRI showed me exactly where my pain was coming from and gave me several options of treatment. We discussed all options in detail, I choose to do L4/L5 Endoscopic Surgery. I had my surgery yesterday, today I feel good, just a little stiff, but I have NO PAIN!! Also Dr. Hanson gives you his own personal cell phone # he calls you personally to follow up with you ...what Dr. does that, No Dr. I'v ever had. Gotta give a extra "Thank You" to his Anesthesia staff they really went above and beyond for me. 10 months of terrible pain solved in a single day. I'm a 24 year old who should not be dealing with spine issues! I did everything by the books, was given medicine, got an injection, did physical therapy, everything nothing helped the agony in my lower back and leg. I could barely walk, and spent tons of money taking cabs because I couldn't sit on the bus to get to work for too long. And sleep was impossible. I had a herniated disc pressed into my sciatic nerve and surgery was the only thing left to consider. Dr. Hanson is a brilliant mind who wasted no time in telling us what he thought was going on in that my disc was contained and needed help being removed to put pressure off of the nerve. he explained the procedure and took time to answer any questions me or my mother had. Surgery was a breeze. It's hard for me to even believe it happened because it was such a walk in the park! I'm up and walking around normally, I was even the night of the procedure! Dr. Hanson has truly given me my life back and I couldn't be more thankful. Not to mention he's so personable with his clients, he even shared his phone number so we could talk about any questions or concerns I have! Thank you Dr. Hanson! :) I'm finally living my own life again!! I am 61 years old, and for 5 years, dealt with low back pain and impingement of nerves down my right leg, and through prior consults, non invasive procedures could not fix the problem. I reviewed board certified orthopedic spine surgeons and chose Dr. Dan Hanson. He was compassionate, listened to my goals, and analyzed my back problem . He has impeccable skills in spacial relations (3D overview of my spine issues), and was the only Physician that came up with a way to fuse L3-L4 and decompress the nerve impingment to my right leg with incisions only in the back. The other two consults said I would not only need back surgery, but they would also have to open my abdomen to repair the problems. It has been six months post-op now, and I have no pain!!! I am out gardening and biking everyday. I just have to remember to do some core strength exercises Dr. Hanson gave to me, so I do not put as much strain on my back doing the things I love. Thank you, Dr. Hanson, and to all of your team! If you're ever having neck or spine pain, Dr. Dan Hanson is who you want to call. Everyone is extremely friendly and always has the patients best interest in mind. After months (nearly a year) of dealing with my local (Western Wisconsin) medical facilities it was determined I had (2) badly worn discs. The only offer I could get from a local surgeon was 2 level fusion. At 45 years old and in good health, I didn't believe fusion was the best option for my situation. I managed to track down Dr. Hanson at Minnesota Spine Institute via the recommendation of my chiropractor. I met with Dr. Hanson and he agreed that fusion wasn't the best option for me. 2 weeks later Dr. Hanson installed (2) Mobi-C artificial discs. The follow up and personal contact I received from MSI was second to none. They checked on me regularly and made sure I was doing well. Fortunately the surgery went so well all I ever had to report was "Doing great, just need a little more time to heal". I am now 1 month post op and feeling better today than I have in a LONG time. If you are frustrated with your medical care and want a solution, go see Dr. Hanson. He is most interested in fixing your issues not billing your insurance company for care you don't need and delays that don't fix your issue! Our surgical center is built on excellence through education, research and applied results in today's latest advancements in spine surgery technologies. Traditional spine surgery involves making an incision, cutting the muscle off the spine, placing a retractor, and then performing the surgery through an open approach. An endoscopic spine procedure is typically done through a 7mm incision, a portal is placed separating the muscle fibers, and the procedure is performed through a small tube. The endoscopic approach leads to less pain, quicker recovery, and less scar tissue. 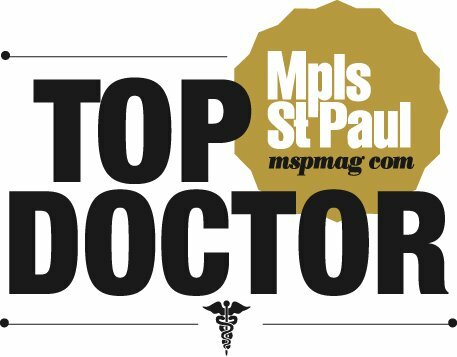 Dr. Hanson has been awarded Top Doctor for the fourth year in a row. This is his sixth recent award for his outstanding work in the Twin Cities metro area. Thank you for visiting Minnesota Spine Institute! Providing advanced surgical solutions for today's spine care. We have helped thousands of patients regain their lives back using advanced pain management solutions. Call today!